This Touratech Suspension DDA / Plug & Travel shock absorber is an absolutely top class suspension component for your BMW R1200GS Adventure equipped with the BMW DDC system. This premium shock absorber is systematically designed for long-distance touring with lots of luggage, on any type of road surface - and even off-road. 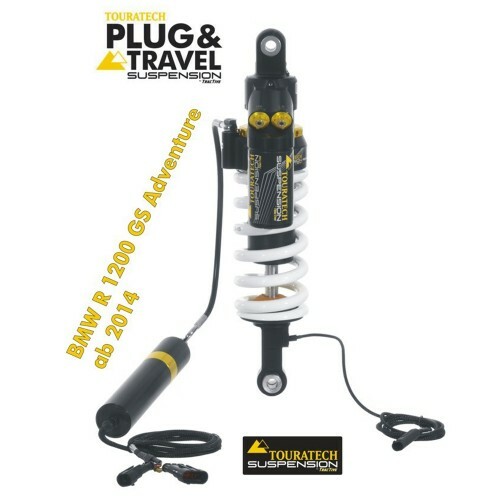 This Touratech Suspension DDA / Plug & Travel shock absorber simply replaces the BMW DDC shock. The existing plug connectors and switches on the handlebar are retained and used as usual. As a result, this shock absorber becomes an integral part of the motorcycle via the original BMW control unit. This shock absorber can be used together with the original BMW front shock absorber. The Touratech suspension system that adapts itself to the adventurer inside you - so all you have to do is ride! This Touratech Suspension DDA / Plug & Travel shock absorber is manufactured using the same precision components and parts that have been tried-and-tested in our shock absorbers over thousands of miles of touring, under the most intense conditions. At the heart of this shock absorber is the high-performance DDA valve, developed and patented by Tractive. It allows the damping to adjust in fractions of a second to any riding situation. To withstand the rigours of long-distance touring, our shock absorbers have a larger piston diameter, which means a larger oil capacity. This enables better cooling with a high damping frequency. As a result, the shock absorber and damping are more stable and there is less stress on the seals. - For the rigours of long-distance touring, we use a larger piston diameter and the floating piston design allows the oil and nitrogen to work separately. This achieves optimal heat dissipation under heavy loads while giving the shock absorber extremely fine response characteristics. - Typical for Touratech - uses tried-and-tested precision components and parts. - External reservoir provides extra compression damping adjustment. - Separate high speed and low speed settings for extremely fine and effective adjustment of the semi-active Touratech DDA basic damping setup. - Example application: Ideal adjustment for long off-road rides with heavy luggage. Ideal damping adjustment for journeys on country roads and/or a sporty riding style. - Enables finer response from semi-active suspension system even with very high damping frequency (bad roads, off-road) while still maintaining high shock absorber life expectancy. - All riding modes and settings options in the BMW R1200GS Adventure DDC system are fully retained. - This Touratech shock absorber can be used together with the original BMW front shock absorber. - The Touratech DDA / Plug & Travel shock absorber is operated via the original BMW handlebar controls. - In the riding mode you select, the road conditions are actively monitored as you ride. Your bike's suspension adjusts to maintain perfect balance. The lean angle and acceleration sensors on your BMW R1200GS Adventure are also actively monitored. The shock absorber adjusts the damping in fractions of a second via the patented DDA valve - virtually in real-time - and is always optimally matched to the prevailing riding conditions. - This gives you the greatest possible comfort, finest level of feedback and fantastic ride dynamics. - The Touratech DDA shock absorber provides the best possible safety reserves since the shock detects all riding conditions and responds optimally in near real-time. - Any volume of luggage from a tail bag to a fully loaded luggage system, with or without a pillion passenger, can be accommodated and the suspension setup easily adjusted via the BMW handlebar controls. - The Touratech Suspension Plug & Travel shock absorber optimally implements the selected riding mode. - The shock absorber described here is designed for a rider's weight including luggage of up to 100 kg. * Modifications are possible for much heavier loads or other unusual requirements. - With this suspension solution, we recommend replacing the rear and front shock absorbers together.